Simple cheesy potatoes cooked on the grill. 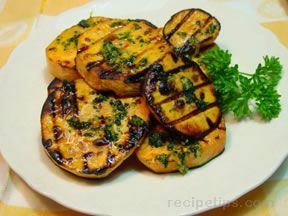 A perfect side dish to any of your grilled entrees. Make up 4 foil packets for individual servings or 1 large packet; use double layers of foil. 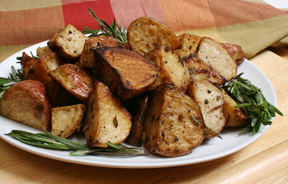 Peel the potatoes and slice into small pieces; place in the foil packets, distributing evenly. Cut butter into tabs and place evenly over the potatoes. Place the slices of Velveeta cheese over the top. Gather edges of foil and seal tightly. Place directly on a preheated grill. Grill at medium high heat, approximately 400° F. for 1 1/1 to 2 hours or until tender. 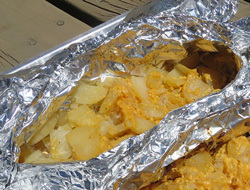 Carefully open sealed edge of foil packet and poke potatoes with a fork to check to see if they are tender. If not, seal back up and cook until done. 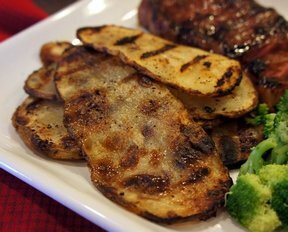 "My wife fixed these potatoes up and I grilled them on our gas grill. Cooked for 1 1/2 hours and they turned out great. I liked the crispy ones on the bottom. Next time we might add a little onion in the packet also."